Part of a Nieman Watchdog series, 'Reporting the Endgame', and the second of two articles on the national news media's weak coverage of antiwar activities. Click here for the first one. The event was covered by The Huffington Post, the Socialist Worker, OpEd News, Salem-News.com in Oregon, and the Sydney (Australia) Morning Herald, but was ignored by The Washington Post, The New York Times and almost all other mainstream media. NPR gave it 143 words, and USA Today 74 words. Various activists that day did what once upon a time you would have expected the mainstream press to do – captured the drama and import of the event by conducting their own interviews with veterans and other participants, and filming and photographing the arrests and speeches, including this impassioned speech by Chris Hedges, and posting them on various websites, blogs andYouTube. 2. 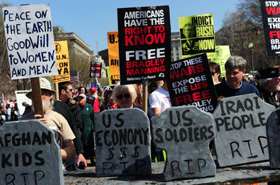 A second example: This past March 19, the eighth anniversary of the start of the war in Iraq, several hundred people gathered at the White House to protest the war. There were 113 civil-disobedience arrests this time. The Washington Post did run a few paragraphs from a more comprehensive Associated Press account of the protest, which also incorporated news of rallies in New York City and elsewhere in the country. The Deseret News – in Utah, 2,000 miles away – ran the full AP account, as did CBS on its website. Loeb told Nieman Watchdog that the Post has no specific policy on covering antiwar protests, but rather: "We make decisions on a case-by-case, day-by-day basis. We try to assess the newsworthiness in the context of all the events that are happening on any given day and then make a judgment on what to cover." In making daily assignments, Loeb said, they draw on AP’s and other organizations’ day-book listing of events, as well as a regular barrage of event notifications sent to the Post via email and Twitter. Although the Post like other major news media has experienced severe staff cutbacks in recent years, Loeb said that decisions not to cover a particular event are "not really a case of lack of resources." If an event is deemed newsworthy enough, "we would have the resources to cover it." Loeb, who became the Post’s local editor just over five months ago, noted that because Washington is the nation's capital, it draws numerous rallies of one type or another every week, and the paper has to make decisions on which ones are newsworthy enough to warrant coverage. He said "obviously, any demonstration that draws large crowds," or produces a large number of arrests is one that should be covered. In answer to another question, Loeb said that the Post would also take into consideration anniversaries of events – such as the start of a war – in determining whether or not to cover a specific antiwar protest. As to the two specific anti-war protests in December and March, cited above, that the Post failed to cover, Loeb said there was "no file I can look at to say why we didn't" cover those two protests, but "looking back at both events now, both were newsworthy and I would like to have covered both." We singled out the Post in the above two examples because of its unique proximity to the federal government targets of so many demonstrations, but it is hardly alone among the major media in ignoring protests. The New York Times, for example, has an equally spotty record of covering antiwar events in New York, as well as in Washington and elsewhere. Most recently, the Times ignored an April 9 antiwar rally in its own backyard that attracted several thousand people to Union Square in Manhattan and that also featured a march down Broadway to Foley Square. Our research confirmed what Fairness & Accuracy in Reporting (FAIR) reported – that only the on-line news site The Gothamist (here and here), the Socialist Worker, and local TV outlets WABC and NY1 covered the New York rally, as did, apparently, Russia Today (RT) television. FAIR reported that the rally’s organizers “say they put serious resources into media outreach, and held a press conference the day before the event,” but to little obvious avail. As for the March 19th protests, it wasn't just the Washington Post that blew meaningful coverage. A video we reviewed showed that in Chicago a substantial number of people marched that day against the wars in Iraq, Afghanistan and Libya. The Chicago Tribune reported, briefly and incorrectly, that 200 people marched on Michigan Avenue and nearby streets. Either the Tribune reporters weren’t skilled at counting or weren’t anywhere near the march, but the four-and-a-half-minute video on YouTube showed people constantly streaming across the screen several abreast (and still coming when the video ended). Chicago’s WBBM NewsRadio put the tally at 1,000 (which was clearly closer to the mark than the Tribune’s estimate), while the Chicago Sun-Times merely reported there were “crowds” of people without putting a number on it. The Sun-Times carried on the long-standing tradition of many major newspapers of treating antiwar protests as police and transportation stories, rather than First Amendment stories with a message, using this headline: “Downtown anti-war demonstrations peaceful.” The paper assured readers in the lead paragraph that police said it was going peacefully, while the last two paragraphs of the eight-paragraph story reported on traffic disruption and the rerouting of 10 bus routes that were affected by the protest. If the Chicago protesters lacked national coverage, so did thousands of other marchers that day in Hollywood – including students from 40 high schools and community colleges, who can be seen here, here, and here. And neither did we see many hundreds more in San Francisco, Portland, Seattle and other cities. The Los Angeles Times, in fact, reported nothing we could find on the Hollywood antiwar march or other marches in California and nationwide, but did manage to report on two-dozen white supremacists who “took to the streets in Claremont on Saturday to protest what they view as an unbridled flow of illegal immigration into the region, including the small college town.” That was certainly a worthy story, as the group was “interrupted by a counter-protest of more than 200 immigrant rights activists – but not to the exclusion of a same-day antiwar march which a major newspaper should be able to cover, too. This is not to say that the mainstream media don’t occasionally pay attention to antiwar activists. For example, The New York Times on September 6, 2009 had a lengthy profile on Father Carl Kabat, longtime peace activist and one of the original Plowshares 8 with Fathers Philip and Daniel Berrigan. And The Washington Post, one day after not sending a reporter to cover the White House protest on the eighth anniversary of the invasion of Iraq, had a first-rate story on a rally at Quantico Marine Corps Base in support of accused Wikileaks leaker PFC Bradley Manning. But such pieces are all too rare in the national news media. Several other recent significant actions also went unreported or underreported in the mainstream media. For example, on May 3 of this year, The National Catholic Reporter (NCR) reported in a lengthy article that 52 peace activists, most connected to Catholic Worker houses across the country, were arrested in Kansas City in a nonviolent protest the previous day “after blocking the gate to the construction site" of a new nuclear weapons-related facility. They were charged with trespassing and ordered to appear in court, where several of them pleaded guilty on July 19. Those pleading guilty received varying sentences – fines of up to $500 in some cases, a few days of jail time for others, and community service for others. Other defendants were ordered to appear for trial on September 28. The new facility, operated by Honeywell, will replace an existing plant that is “responsible for the production and assembly of approximately 85 percent of the non-nuclear components for the U.S. nuclear arsenal.” It has been the target of repeated protests, with 14 activists arrested at the site last August “after they halted work for over an hour by surrounding earth moving equipment.” While national media ignored the protest, locally-based Kansas City KSHB-TV covered the event. Although marches and nonviolent acts of conscience against wars and nuclear weapons get short shrift in the press these days, such was not always the case, certainly not in the late 1960s and early 1970s. The defining nonviolent action of that era occurred in 1968 when nine activists – later dubbed the Catonsville 9 – seized 378 files from the Baltimore County, MD, draft board and then, in a nearby parking lot, poured homemade napalm on the documents before burning them. If it were not for the Internet, and rare radio shows like Amy Goodman’s Democracy Now! on Pacifica and other public radio stations, most people today who are not actively involved with antiwar groups would not have access to information about the scores of antiwar rallies, marches, vigils, and teach-ins at various locations across the country over the past few years. As the mainstream media ignore antiwar activity, alternative on-line web sites and bloggers have picked up some of the slack with videos, photographs, press releases and stories describing events, interviews with participants, as well as tracking the trials and jail terms for protesters who have been arrested. On the broadcast side, these days you will get more coverage of a U.S. antiwar protest (or any other kind of U.S. demonstration with a progressive angle) on little-seen Al Jazeera or RT (Russia Today) television, than on the major U.S. network and cable outlets and NPR. It's not just antiwar protests that go uncovered. The press in recent years has typically ignored or under-reported large demonstrations in major U.S. cities at banks, corporate offices and government agencies in support of jobs programs, single-payer health coverage, alternative energy and prosecution of Wall Street bankers over the nation's financial crisis. Many activists view the mainstream media as hopeless. In Iraq, in the lead-up to the U.S. forces’ “shock-and-awe” attack in February 2003, activist Kathy Kelly and members of her-then group, Voices in the Wilderness, had gone to Baghdad as witnesses in support of Iraqi civilians to try to draw attention to the bombardment they knew was to come. Kelly told Nieman Watchdog that despite repeated efforts to get National Public Radio to cover them, NPR responded that it wouldn’t provide coverage of their activities because it didn’t want to give Voices in the Wilderness a platform for their antiwar message. This, she said, is the general feeling of most of the mainstream media – that antiwar actions aren’t worthy of coverage. Kelly said she and other activists no longer expect that any of their actions will be covered by mainstream media. There are many movements going on but small numbers. If the people who go on sites all day would actually show up and support actions, the News would cover. But I would no longer send an announcement as they are not worth it and should take it as an insult. Michele, thousands showed up day after day to protest the actions of ALEC-directed Republicans in Madison, WI this past spring. Several of the largest rallies (>10,000 people) went completely unreported in the national mainstream press, and were barely reported in the local mainstream press. So stop blaming protesters for not getting out there. Usefull idiots aren't needed anymore. The MSM used you to promote the "hope and change" candidate. Now that Obama is in they don't need you if you aren't wearing your cheerleader outfits. I didn't expect you to even consider this point because anyone naive enough to vote for a slogan is wearing blinders to begin with. Now follow another slogan and MoveOn .org.